SMITE Tactics: Hand of the Gods has come a long way from the time it was conceived, and the main god wandered around on the battlefield, to where it is in the full launch. It received 37 updates, both major and minor between the Alpha and Full Launch, which was on February 20th, 2018. This is a game that blends the tactical aspects of a board game and the strategy of a CCG (Collectible Card Game), set in the SMITE universe. The gods you see in the MOBA, you’ll see here and contain that same flavor. Thanatos still descends upon someone who has low health and executes them, Cabrakan spams his annoying Quake everytime you try to act. Instead of acting aggressively upon the god such as it was when the game was “Smite Tactics”, now there is a summoning stone with a set health pool. Breaking it down to 0 HP means you win the match. Each deck will have 25 cards, with a 2 card cap per specific card (though in some cases, you can only have 1 of a card). They range from Common to Legendary and can be crafted with Essence (a dangerous word from older Paladins), or acquired in a number of ways. Each deck leader has a special power they can utilize for 2 Mana (which they can do once a turn). None of these are broken, but many are frustrating (looking at you, Zeus). There are card packs with varying rarity, or you can outright purchase the collections. Hand of the Gods: Smite Tactics is free-to-play with the option to purchase packs or purchase outright bundles for specific gods. This is the first thing I feel like we should discuss because one of the most crippling things about a CCG is if the game will have a high cap for spending money in order to be competitive. There are other card games that release lots of expansions, and if you want to stay competitive, you better be spending money, or at least farming (and winning) a lot. To give you an idea of what you’d be spending, 400 gems (7.99) acquires an entire pantheon’s card collection. 2x of each normal card, and 1x of each Legendary they provide. The only exception is the Neutral pantheon, which is 600 gems. Though it is fairly easy to grind cards for the game, this does help you get started after you’ve spent some time figuring out which faction fits your playstyle the best. HOTG is not a game where one deck-type or pantheon is superior to all of the others. Though I do play more Ah Puch and Ganesha than anyone else (and Colton for example, plays Odin and Nu Wa more), they are not end-all beat-all decks. Before I get into specific gameplay, here’s a breakdown of what you can expect in each pantheon, to help a new player perhaps make a more informed choice. Gameplay will feel very familiar to those who have played Hearthstone and Duelyst, as it does combine the two styles of competitive play. To be frank, it feels more like Duelyst than it does your average card game. The player that goes first (decided at random) starts with 3 cards and 2 mana. The second player starts with 4 cards and a “Mana” card to give them one temporary mana to balance things out. Before the first turn starts and before that Mana card is doled out, players can redraw up to their entire hand by discarding (clicking) the ones they don’t want. This can be a very stressful thing because now you have to balance “Do I want that 7 drop so I don’t have to wait for it later” over “But if they drop four zombies in one turn I’m going to be in a bad way”. This is a lesson that will simply be learned through countless deck builds and trial-and-error. Players cannot have cross-faction cards in their deck normally, just Neutral and their own faction. There are cards that will break that rule, however, through “Discovering” a god from another pantheon or pulling cards from an enemy graveyard and putting them under your control. Each unit has a set “Movement” value of how far they can go, and they can move through friendly units (but not enemies). Turns have a pretty standard flow to them. First, summoning sickness is removed. You then recharge your Mana/gain another point (up to 10), draw a card, and make your actions. You can play cards at any time during your turn, but this game does not feature a “Counterspell” system where you can interrupt during your opponent’s turn. The only card I’ve seen that does that is a Pillar in the Hindu pantheon, which will counter the next spell your opponent plays. You have a variety of card types at your disposal: creatures (move, attack, has cool abilities), structures (can’t attack usually, health pool, useful powers), enchantments (boost the power of your god power), and spell/activated cards (direct damage, pulling cards from graveyard/from outside the game, summons, et cetera). It’s also important to note which creatures do what, which are ranged and which are melee. Take time to learn their powers, and the list of special traits of Hand of the Gods. You can move and attack at any point during your turn, provided the creature has the ability to do so. You can use your god ability once per turn also, and they are all 2 mana (unless you have a modifier in play). Speaking of creatures, it’s very important to note that while you can Move-then-Attack, you cannot Attack-then-Move. Once you have committed to an attack, that’s it, that creature is done for the turn unless they have a passive that can proc/activate. Creatures typically do not have an ability they “activate”, unless it comes in the form of the Warcry ability, which makes that creature’s power go off when they are put into play. The vast amount of powers creatures have are passives and will activate when the time is right, which is great because having to pause the game flow to activate something really slows down a card game. Actual strategy and skill, when to use creatures/cards/god abilities will come with practice, but the game is very good about teaching the basics. When you cast one of these creatures, you can only summon them around your Summoning Stone, unless the card text states otherwise (Ah Puch). So if you have a really solid lead, you can prevent your opponent from ever playing creatures, if you can simply occupy the entire grid around their Stone. One of the great things about Hand of the Gods is that matches tend to last anywhere from 5-10 minutes. My shortest match was 3:30, my longest somewhere in the 12/13 minute range. As someone who plays at very weird times, I worry about there being long match queues, but in the 20-25 Rank Range, I still get matches under a minute, even around 5 am on a Sunday morning. However, I will note that as this game lacks counterplay in many ways. Once your opponent has overwhelmed the board, unless you have some serious cards waiting, it can feel impossible to win. Thankfully, matches don’t take long nor does the queue. I’ve gone from having the zone flooded with 4/4 zombies, without a single enemy unit on the field to losing a match, because Zeus had one spell in his hand to kill all non-gods. The matches can feel a little lopsided if you don’t know what you’re doing or get outplayed, but I am glad that it doesn’t have tons of counter options. The counter options come in the form of out-maneuvering/out-playing on the actual board. Another solid thing about Hand of the Gods is that it has a lot of game modes. You have the “Tutorial” to test your decks against the AI/Learn the basics of the game, and “Challenge” if you want to play in a non-ranked, non-competitive format. Challenge lets you tackle one of the people on your friends list by inviting them to a friendly duel. Versus is the standard go-to mode, and you start at Rank 30 and try to climb your way down to 1. Each player starts at 30 on a fresh account/season and has 6 stones under their rank number. As you win or lose matches, you will gain or lose a stone, and if you run out you get demoted. You can’t lose more than one of these stones if you are on a losing streak, but you can gain more than one if you go on a winning streak (which did occur in this write-up). There is a safety of course. There are rank locks every five levels that prevent you from falling further down (25, 20, 15, 10, 5, and 1) so you can’t just drop back down to 30, once you’ve hit 25 and so on. This is to allow players to keep climbing and not feel punished for losing, which will inevitably happen. This is very much a game of checks and balances, and many decks will feel strong one match, and then absolutely out-classed in the next. Since it’s very easy to get cards, most players will quickly have everything they need to experiment with. The next match type is the “Arena”, where you can spend Gems to build a deck of a god picked at random. Like in many online card games, this is all 100% random and you could wind up with tons of copies of the same card (above the 2 card limit), and just decimate people. The better you perform before you hit 3 losses, the better your rewards are. People who are good at drafting will excel here. Then there’s the “Gauntlet”. These are special matches that last for a certain period of time, where if you win five matches in a row under special conditions, you win awesome cosmetic prizes, packs, and favor! Currently, there is “Time Shift” (Each turn is 30 seconds, all normal cards allowed) and the next to unlock is “Colossal” (Decks must contain cards of 5 cost or higher, players start with 5 mana). This is optional, but certainly challenging and worthwhile. These modes can also teach you things you didn’t know about the game, such as how to act in particular, even hopeless situations. I appreciate that Hand of the Gods is easily accessible. While it is free to play, the option is there to acquire an entire faction’s worth of cards, more than enough to build a deck with. The cost is not high (again, about 8 bucks, which is less than your average real-life card game booster deck), and they give every card that faction has. However, I still do not know if the game will be receiving further cards beyond these. I can only imagine the game will continue to be balanced, and expanded, but if it goes too far I wonder if these faction bundles will be gated/limited. If the game does not expand beyond this point, it will eventually hit a point where everyone has everything and all the deck types will likely be discovered. I don’t think that will be the case, but only time will tell on that front. The decks feel balanced, the changing game modes are challenging, the actual gameplay is solid, and it is not overly challenging to get started. I see the reason for not having tons of counter mechanics, but I do feel like sometimes it simplifies or dumbs down the matches. If not that, they can occasionally feel unwinnable because your opponent just happens to have all the answers. That’s the risk you take playing in a card game, and I’m grateful that at least this one doesn’t have thousands of cards updated in every year where if you don’t have them, you cannot possibly win. They have created a card game that is easy to learn, reasonably priced, and balanced around skill. While having all the cards is great, it won’t mean a damn thing if you don’t know how to apply them in a tactical manner. Simply having a crushing combo won’t mean anything if you don’t know when and where to use it. 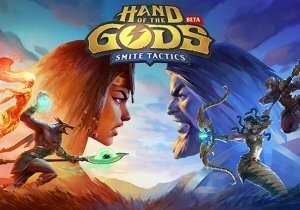 Hand of the Gods: Smite Tactics is a truly interesting expansion of the SMITE universe, and I do look forward to seeing what comes of it. The war is inevitable - Sony Online Entertainment has announced PlanetSide 2 has officially launched in North America and Europe.